A special edition of Roulette using a fun Marvel theme with the addition of a bonus round. Very fun to play, and in my opinion an excellent idea which I think should be expanded to include other franchises as well. I’m sure you have all heard of the Marvel franchise, and this Playtech game not only adds a Marvel theme but also a great new feature to roulette. Whether you’re a fan of Marvel or not, I’m sure you will enjoy the exciting bonus round and new design. When you’re ready to play, select the chip corresponding to the amount you wish to bet. Then select the area where you want to place your bet. Continue to click the area to increase your bet, or shift click on it to remove an amount equal to the chip you have selected. Finally, when you’re ready, click ‘Spin’. If you’re numbers come up, your winnings will be left on the table for the next round (this can be disabled in the game settings). Each bonus round guarantees a win. The pay-out is calculated by multiplying your bet by the amount shown above, so there are huge profits to be made. Marvel Roulette is a really fun version of the game which includes an additional bonus round with reels. 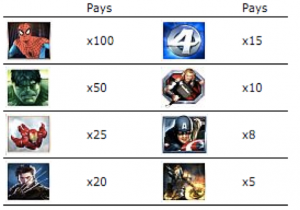 Whether you decide to include the Marvel bonus option frequently during the game or not, the unique theme is exciting and different to the typical roulette layout so it’s worth a try.